Click here to see the weekly themes! What is Parents & Tots?! A uniquely structured program that offers a place for caregivers and toddlers to play, learn and develop while meeting the animals at Double J! What's more tot-thrilling than farm animals? Little ones can learn about real live farm animals in the Parents & Tots classes at the Double J's Farm! 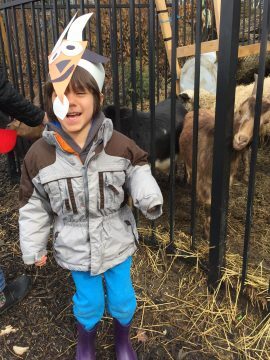 In each 60 minute class, a parent/toddler duo might explore the farm grounds, listen to an animal-centric story, create a craft, feed animals, participate in Farm Yoga or play various games! Each class is themed (e.g. Lucky Lizards, Animals of the Night, etc.) and will guide our activities for the week. This is the perfect way to get your little one ready for Junior Farmers! you receive a complimentary class! *Offer only good towards a Parents & Tots class. *Families are responsible for keeping track of stamp card. 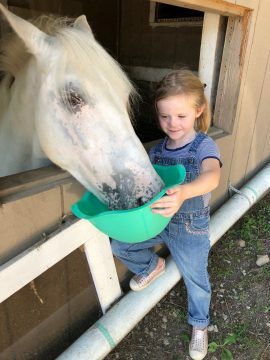 A pre-school age enrichment program for kids who love animals and nature that will foster their independence and curiosity as they get down and dirty on the farm! At Double J Farm, our Junior Farmers learn through hands-on, nature-based experiences that address the developmental needs of children ages 3 to 6 as they explore the plant life and animals at our farm. Your animal lover or critter extraordinaire will want to join us for this unique, down in the dirt learning experience that will last a lifetime! Every week has its own theme, so your child will learn new concepts all year long! These themes guide our educational activities and include a variety of: animal, agricultural, science, and nature topics. Additional $15 to add on a Tiny Rider lesson at the end of class! When you attend a Junior Farmer class, your child will receive a stamp card. After attending 10 classes, you receive a complimentary class! *Offer only good towards Junior Farmer class. Our Summer Tiny Animal Adventurer’s program incorporate some your favorite parts of Parents & Tots and Junior Farmers with summer fun! Are your kiddos too young for all day summer camps? This is the perfect way to involve your little ones in the fun at our farm! 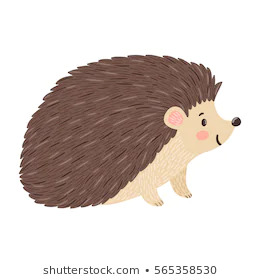 Activities include: story time, creating art masterpieces, planting in our garden, sensory activities, cooking in the kitchen, and of course meeting the animals! Through songs, stories, art, cooking, science, and exploration, your child will be immersed in the life of the amazing animals, plants, and habitats of Double J Farm! Q- What happens if my child can't make one of the classes? A- We have a 72-hour cancellation policy. If you contact us by phone and/or email 72 hours prior to the class start, we can re-schedule your child's class. Refunds can be given 14 days prior to the class session. Payment and rescheduling cannot be credited towards other camps, classes, or lessons. Q.- Do you take drop-ins? A- We do not take drop-ins, you must pre-register online. Q- What can I do if a class session is booked at capacity? A- You can sign up for the wait list, and if there are any cancellations, we will contact you to add your child to the roster. Q- Does my child need to be potty trained? A- For Junior Farmer's admittance, yes all children must be potty trained. Q- What should my child wear? A- Your child should wear comfortable clothes that you wouldn't mind getting a little dirty. They will be walking around a farm and around large animals, so protective boots are strongly encouraged even if they are not riding. **Winter- Especially for their riding lesson make sure your child is sent with: warm gloves and socks, boots, and an extra layer of pants they can put on before riding.